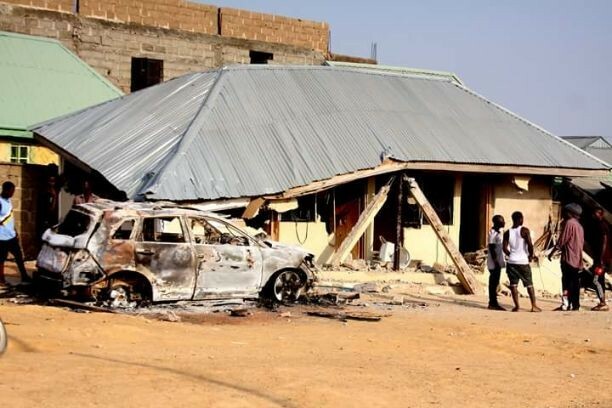 People of Bayan Dutse, Narayi, a community in Chikun Local Government area of Kaduna State were on Thursday thrown into temporary security threat when a group of angry youth razed a Celestial Church of Christ ‎and part of a police outpost in the area over mysterious death of a colleague. The burning of the church and Police outpost in the area was as a result of the alleged involvement of the 78-year-old Prophet in charge of the Parish, Steven Babatunde Shitu in the death of 21-year-old ‎Sylvester Friday who was working in the church until his death. Available information showed that, the accusation, protection and escape took place Wednesday evening but the church and the police outpost were set on fire because police gave the Pastor protective custody which prevented him from being lynched by angry mob. The youth alleged that, the late young man must have been used for ritual by the septuagenarian in charge of the Parish. There was no casualty recorded from any party to the unrest. Public Relations Officer, Kaduna State Police Command, ASP Aliyu Mukhtar, whi cinfirmed the development said, five persons have been arrested in connection with the incident. “Yes it is true that some miscreants set ablaze a Celestial church and a police outpost in Narayi. The church was razed but only a part of the police outpost was touched. “The youth were angry that police gave the church pastor 78-old-Steven Babatunde Shitu protective custody. “They demanded for his release so as to lynch him. But our personnel refused to hand him over to them so they decided to take laws into their hands. “But our men were able to dispersed them on Wednesday. But they later regrouped around 4: am on Thursday to attack the church and the Police outpost. So far five people have been arrested”, the Police spokesman for the command said. According to him, the State Commissioner of Police, Austin Iwar has already gave a directive that anybody who took part in that incident should be arrested and charged to court to serve as deterrent. However, Normalcy has since returned to the area just as Police assured that the command will get all those involved in the act.